Welcome to Honey Frame Packaging, the box that gives you the opportunity to market and sell a full frame of your honey direct from the hive to the table. Unlike cut comb or section honey, a full frame of honey is different, impressive, hassle free, easy to do and a lot more profitable. Honey Frame Packaging continues to receive praise from beekeepers who use it to sell their full frames of comb honey. The design has also won an award at the prestigious National Honey Show. 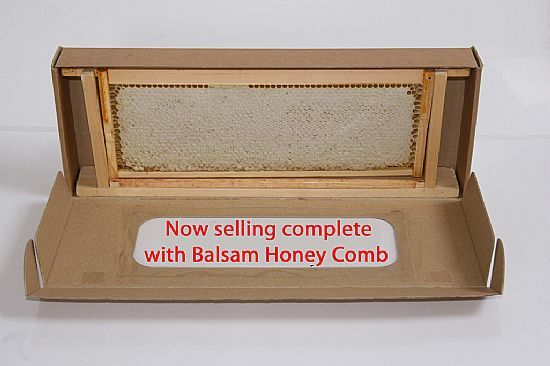 Full frames of beautiful BALSAM HONEY COMB (available from October) Simply click our 'Buy Now' menu button on the left . Your honey will be packaged in one of our boxes secure in one of our wooden stands.